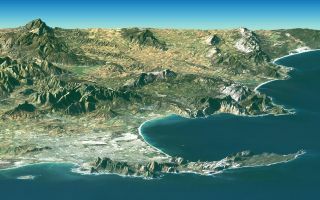 Cape Town and the Cape of Good Hope, South Africa, appear in the foreground of this perspective view generated from a Landsat satellite image and elevation data from the Shuttle Radar Topography Mission (SRTM). In this space wallpaper, Cape Town and the Cape of Good Hope, South Africa, appear in the foreground of this perspective view generated from a Landsat satellite image and elevation data from the Shuttle Radar Topography Mission (SRTM). The city center is located at Table Bay (at the lower left), adjacent to Table Mountain, a 1,086-meter (3,563-foot) tall sandstone and granite natural landmark.